A-PDF Rename can use PDF files' metadata to change the PDF file name, include Title, Author, Subject, Keyword, Creator, Producer even file size. A-PDF Rename can picked up a piece of text inside PDF file to name the file. For example, you have a lot of invoice file, it can search the invoice number using the preset rule, then use the number as part of file name or metadata(Title, Author, Creator, Producer, Subject and Keyword). Simple mode, use macro as name and metadata. For example, %Title% means the Title properties in PDF file. PDF Metadata(known as properties, meta tags) include Title, Author, Subject, Keyword and more. A-PDF Name can update metadata of PDF file as changing name. You can pass file name or part to metadata. It is very useful for Sony Reader which read metadata firstly, instead of file name. A-PDF Rename can process hundreds documents one time and very fast. 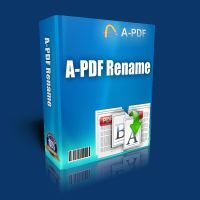 A-PDF Rename is a standalone program costing only $27. It does NOT require Adobe Acrobat Pro, which costs hundreds of dollars. A-PDF Rename can work with command line, as you defined Rename rules, you can reuse the rule to rename PDF file daily. 7: Script file not found. Source file: Source PDF file. -T<New title>    Modify title, can be a Macros. -A<New author>   Modify author, can be a Macros. -J<New subject>  Modify subject, can be a Macros. -K<New keywords> Modify keywords, can be a Macros. -C<Script File>:  Rename by Script. [-M]: Copy file mode. Do not move source file. [-I]: Ignore preview. Do not require confirmation.